Prepare to enter twelve magical, mythological worlds full of an incredible array of gods, monsters, heroes, tricksters, and fantastical beasts! 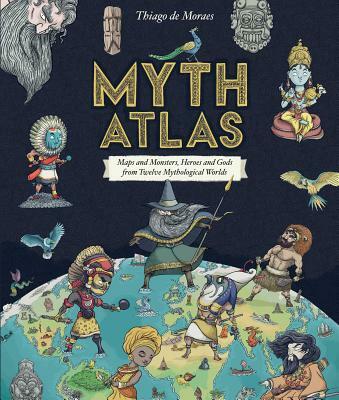 This atlas of mythology shows how twelve extraordinary cultures saw the world. For some, it was a giant tree or an upside-down mountain, while others believed they were living on the back of a giant turtle! Children will be fascinated as they travel the world and discover what cultures such as the Greeks, Egyptians, Hindus, Norse, Polynesian, Aztecs, and many more believed. Thiago de Moraes has worked for twenty years as an award-winning art director and commercial illustrator. His first picture book, The Zoomers' Handbook (written with his wife, Ana), was published in 2015, and he's currently working on his next one. Thiago lives in London.